RB-MS4X3 Quad 3 Way Passive Microphone Splitter. The RB-MS4X3 is a passive, quad, “one-to-three” splitter housed in a 19” rack. Each bank is designed to split a single microphone or line source to up to three destinations, using Neutrik XLR connectors. Cable connections are located on the rear panel, with recessed controls and indicators available to the user on the front panel, allowing quick and easy access to setup parameters. The RB-MS4X3 uses high quality audio transformers that are capable of accepting input levels of up to +18dBu, making the splitter useful in both microphone and line level splitting applications. A 30dB pad can be applied to the input, allowing a line level signal to be interfaced into a microphone input with suitable levels and the correct termination. From the external +48VDC power connector. From a microphone amplifier connected to output 1 (direct). 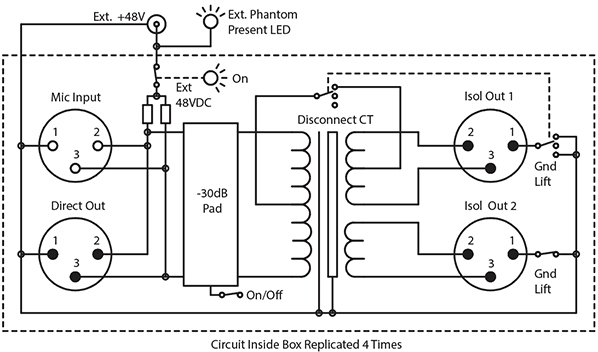 From a microphone amplifier connected to output 2 (phantom loopback). 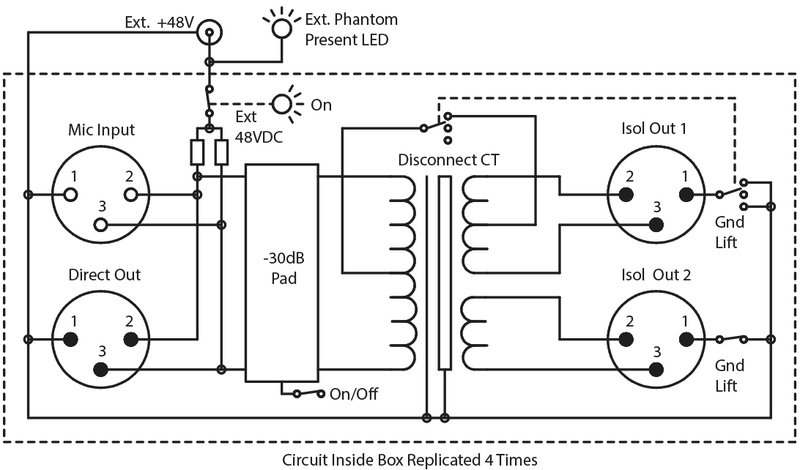 Controlling which method is used to provide phantom power is easy with front panel switches and indicators. It is possible to concurrently power a microphone using any two of the above methods without degrading audio performance, thus providing power supply redundancy. Ground loop hum problems can be quickly eliminated using the front panel toggle switches to lift pin 1 of the output connectors (output 2 and 3 only). RB-MS4X3 Quad 3 way microphone splitter.